April 2012 - An Opportunity to Celebrate Life! Happy 92 BKNG JON !! Over the weekend I was out on a bike ride and couldn’t help but think about my dad. I would say I am a biker because of his influence. 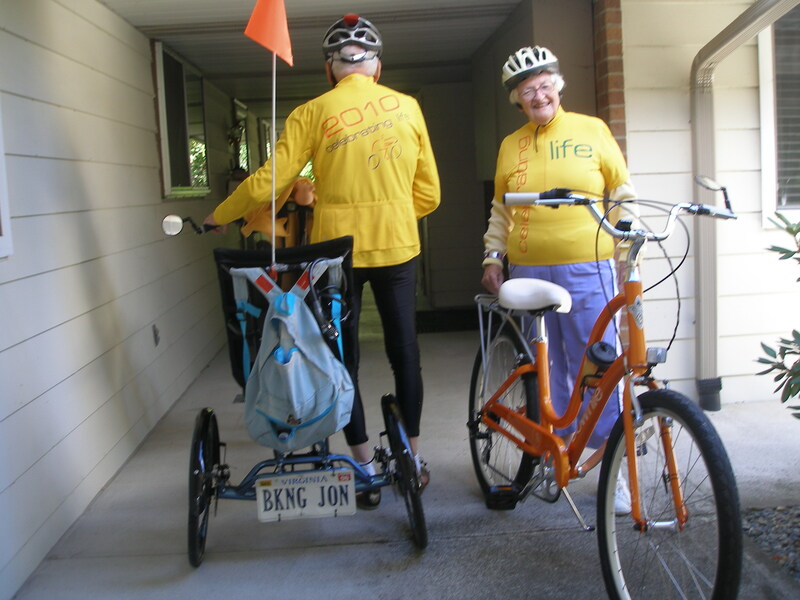 April 29th 2012 is my dad’s 92nd birthday, and he is still biking. I won’t be there to celebrate with him in person, but I figured the next best treat would be to share with the world something that I love about him and find truly inspiring. If this article inspires you, send it on – to celebrate Biking John Clarke. Likely, I am either sitting in an airport or somewhere in the sky between Montana and Baltimore. 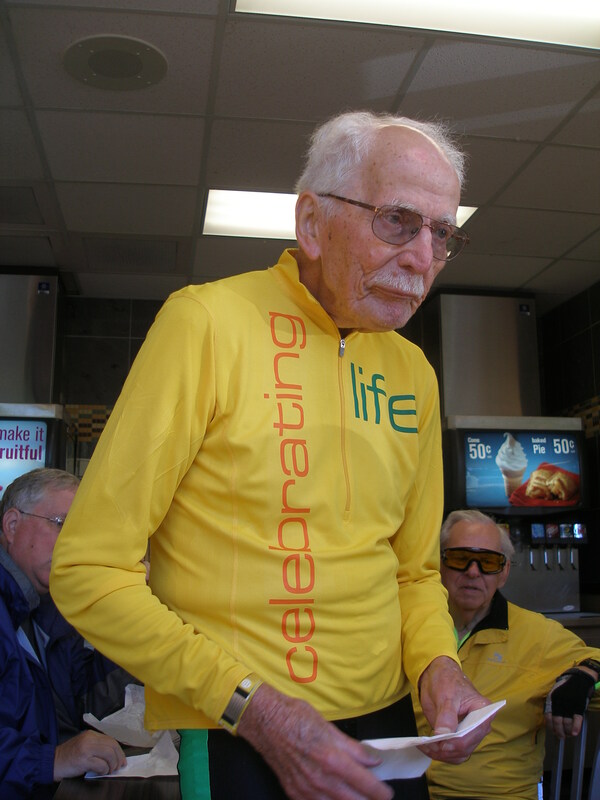 I am hoping you are celebrating your 92nd birthday either biking to McDonald’s for breakfast or taking an afternoon ride to the ice cream parlor. I am not quite certain when your love of biking began. I do remember hearing stories of you and Uncle Corny (your older brother) taking some interesting trips. A ride from Richmond to Virginia Beach before highway 95 opened or the two of you biking on the sandy beaches in fat tire bikes from Virginia beach down to Nags Head, NC. I don’t know all the details of those trips but they sounded like fun. I believe I took my first bike ride to Aunt Sarah’s Pancake House with you around the age of five or six. It was the family Saturday morning breakfast ride. As a family we regularly rode to places for breakfast or ice cream – two of your favorite motivators. Biking is a passion of yours, and I have no doubt, a big part of why you are still ticking and riding well into your senior years. There are many who ride faster and some who have covered more miles, but few who have been as passionate promoting the benefits of biking as you. Back in Richmond, Virginia you started many standing club rides that are still going long after you moved to the west coast. Your bike got you on the cover of Bike Magazine, riding your three speed wearing your suit to work at Ginter Park, elementary school. I think this also gave you a good story on the Bill Crosby Show. I even remember you making it into the Seattle Times newspaper after the earthquake. As I recall, you were thrilled and a bit relieved, to learn from a crowd outside of the capital in Olympia, that there had been an earth quake instead of your fear that you had just had another stroke while out riding. You have many fans on both coast who tell stories of riding with you. My stories are mostly positive. Of course, there were a few times when we got lost, or I thought you took the longest route possible; but honestly, I am incredibly proud and inspired by your passion and commitment to biking. We are very different types of riders. I prefer getting from point A to B as fast as possible, and you, I think enjoy the scenery. I also believe biking is social for you since you have friends all over the country who will tell a story of riding some where, usually for food or drink with you. I tend to go solo. As bring this post to a close, I find myself wishing I was there in Olympia with you riding to celebrate your life! Instead, I am sending this out to all the folks I know. Letting them know what an inspiration you are to me. I hope you are riding for many more years!! Happy Birthday Dad!! In Malcolm Caldwell’s book, Outliers, he talks about people who are masters in certain areas and that this level of mastery takes 10,000 hours of practice. This leaves me wondering what could I honestly say I have ‘mastered’ by this definition. I am known as someone who starts many things and gets to a certain level of ‘know-how’ and moves on. I doubt many would say I was looking to master anything. That being said, I did recently attend a writing workshop and one of the facilitators offered a wonderful gem of wisdom. For all of us in the crowd, who would writing about our own life experiences, she said, “Your own life experience, well that is area you can each say you have 10,000 hours of experience in.” Therefore, I am a master of those stories. Writing them down is another skill all together – but it was good to know I at least have the hours covered to I have mastered the content of my book! So indeed I have been writing down my stories. This is a slow process and not one I am prepared to share yet with the world wide web. However, I am beginning to tap into another potential area of mastery for myself. I think I could say I am a master in surviving. First let’s look at the definition of survive. Indeed, I have ‘survivied’ a good deal longer than expected. The simple stories of this come from reviewing the years of dealing with cancer, (four times); there’s the ‘surviving’ child trauma (no need to go into details); then surviving ‘remembering the flashbacks’ etc.. from those younger years; also, there were my years as ‘only one of two white kids’ in my high school. I have a long list of these type of experiences. The one thing that I learned through all of that was: when faced with life or death, the best strategy is to be in the moment and access some sense of faith, well-being and humor, at least that has carried me through. Even today, when my life is not really about that degree of drama, I can see the signs of my mastery when it comes to preparing for a colonscopy. I had to have one just recently. Those types of test bring up lots of things for me with my medical past dealing with cancer. So I do get myself into that life/death mentality and in that space, I shine. I find a way to take care of myself and be good at setting boundaries around what I need. I also am comfortable with the people I interact with. Meaning all the medical folks, the insurance folks, the people in the waiting room. Suddenly, I am at ease in this environment. I am also good at coping with a setback. It is possible that without a setback I get a bit lost. I don’t like admitting to that. In many ways, I have been creative in ensuring that I regularly have enough drama in my life. I work with leaders and in organizations most often when they are in a crisis. At The Haven, the group work is primarily drawn from strong emotional events in people’s lives. I am am comfortable there. In my own life, I struggle with the ordinary day-to-day. Generally speaking, I do my best work when pushed or at the last minute. I would really like to shift that. However, I first may need to really honor my ‘outlier’ skill set. There may be a way to more creatively and consciously draw upon this skill set. Yes – I can honestly say I have 10,000 hours of practice in ‘surviving’ – remaining functional and useful against the odds. Yes, that was even how I got on my high basketball team. Not because I was a great basketball player but by selling my coach on how slow I was and that he needed that skill set. Indeed, survivial at it’s best. I knew I couldn’t out shoot or out run anyone on the court – but I also knew they needed someone to slow down the run-and-gun scorers – that was me. I am good when things seem the darkest. I seem to see the stars in the blackest of nights. I like that about myself. Thus this blog is to honor my outlier skill set of surviving!! I just started a coaching program with Martha Beck. I am a new cadet. I have mixed feelings about being back at the beginning. Part of me wants to tell everyone just how skilled I am and puff myself up as “been there done this already” person. Why? – because I am solidly in Square One of what Martha Beck calls her Change Cycle, and I am resisting like hell. I signed up for this program when I was competent, confident consultant/coach/counselor. I signed up to enjoy the work that my partner had found so beneficial, and I wanted to join the tribe of folks she was finding so supportive and fun. Yes, I signed up just to learn a few new things and may be start a coaching practice. But no, that’s not what’s happened since. Martha talks about this idea of following your north star. In many ways I really do believe I have been there and done that. Problem though is that my north star keeps offering new possibilities. I sort knew that when I left living on Gabriola Island after 14 years to move back to Seattle and start a partnership and business with CrisMarie. I knew that when we packed up our business and home and moved to Montana to be a part of a spiritual community here. I had hints of another shift when we signed on as Table Group Consulting Principal to launch a stronger brand around some great simple business wisdom. In that moment, we let go of our business brand and aligned ourselves with others. I sort of knew we were shifting to make room for something that was coming. I just wasn’t sure what. Then life started presenting a series of catalytic events (another Martha term for those things that throw you into the Change Cycle). First, our closest friends were suddenly no longer a good fit. That was a heartbreaking process for us all, I believe, and who knows if those fractures will ever heal. Next, we got clarity that even though we LOVE our boxer Bailey, he needs a different home. We travel too much and he is simply a dog that wants his people close by and a buddy who will play with him. Again my heart was/is broken, and we are looking for that perfect, forever home for him. Honestly, I can’t imagine not having him around – so I may be making this harder. Then came the real kicker, our business leader decided he needed to align the brand and business around his faith, which doesn’t fit for us. Suddenly, our plans to shift our business and our life direction was thrust upon us much faster than expected. So instead of being a new cadet just interested in learning some new things about myself, I enter this new journey with a broken heart and a spinning compass (not sure where north is right now). Martha uses a metaphor of a caterpillar changing to a butterfly in explaining her change process. The caterpillar gets a calling to make a cocoon, but honestly, one has to wonder if when she heads to the tree to start making that cocoon if she really has any idea what will happen once she’s in there. Apparently, she turns to goo! That’s right. It’s really the only process like it in the living world of organisms. That caterpillar sets herself up for a major meltdown. Right now, I can relate. I feel a bit like goo. Plus, I don’t really want to go out into the world and connect. I want to hide inside even though it is a gorgeous day out there. I want to be angry at my friends, my business colleagues and even CrisMarie for suggesting Bailey isn’t a good fit. But the truth is, anger is simply a way to avoid what is really happening. I am being called to change – to sink into letting go of what’s been comfortable and secure and look inside and find my inner compass. Sure, I want this to be easy. I want to figure out quickly who will be my new best friends and what our business will be called. I don’t want to feel the sorrow of saying good-bye to my buddy Bailey or the stabbing pain when I see his playful face on a flyer looking for a new home. I don’t want to feel the ache in my chest when I bump into someone who asks how my friend’s new book is coming, and I realize I have no idea because we aren’t talking anymore. No, I don’t like this goo place. I want to escape. That sure would have been easier to do if I hadn’t signed up for this coaching program. Because now instead of simply being along to learn a few new things, I find myself living what I learning – goo and all. It seems now, I can only hope in the end, I come out a butterfly! !